NRC was retained to relocate and contain extensive contamination at a former wood treating facility. The site had a long industrial history, including creosote treatment of poles in earthen pits. 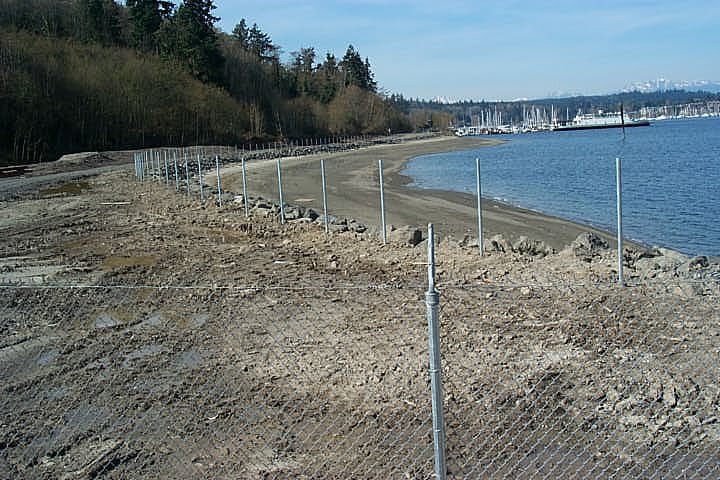 Free product and contaminated soils migrated from the site to a beach and dock area in Eagle Harbor near Bremerton, Washington. The site is adjacent to a major automobile and passenger ferry route, and is now prime beachfront real estate near Seattle. The NRC team won the task order to contain the contamination with a custom-built, water-tight sheet piling structure and to excavate and relocate large amounts of contaminated soils for future treatment. 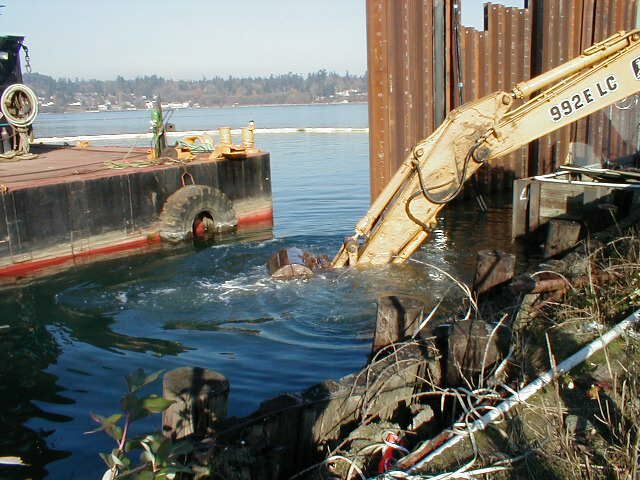 Work restrictions included time limitations for compliance with noise ordinances, extensive tide variations, and the release of free creosote from marine excavations. For work that involved complex environmental and marine aspects of such a high profile and on such a risky project, NRC was a great choice. Over 183,000 square feet of water-tight sheet pile, and 9,000 linear feet of angled sheet pile were installed at depths of 36 to 104 feet below submarine grade. Excavated soils totaled over 25,000 tons, and a marine habitat restoration of a beach area prepared the site for future wildlife and recreational use. The project was completed well before the February 15 migratory fish habitat disturbance deadline, and well before winter storms set in. A series of challenges were overcome, including rerouting a large section of sheet piling around subterranean obstructions and the excavation, decontamination, and disposal of both above ground storage tanks and underground piping. 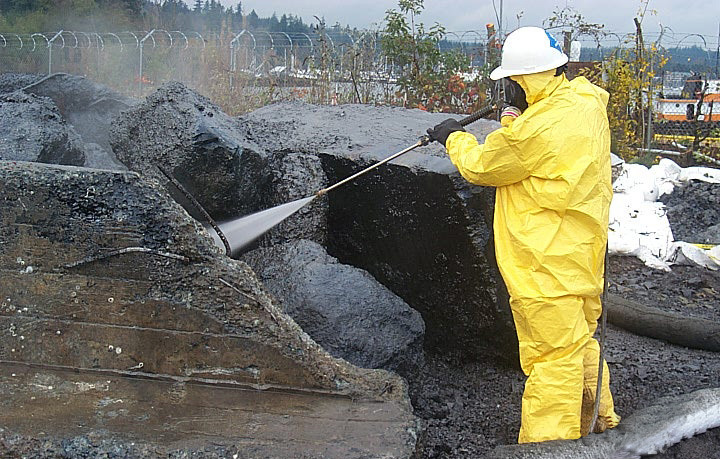 NRC marine emergency response teams were also used to standby during marine excavation that liberated large amounts of free-floating contaminated product. These materials were recovered and properly disposed. All work was completed on schedule and on budget, with ongoing proximity to ferry runs and intense community scrutiny. 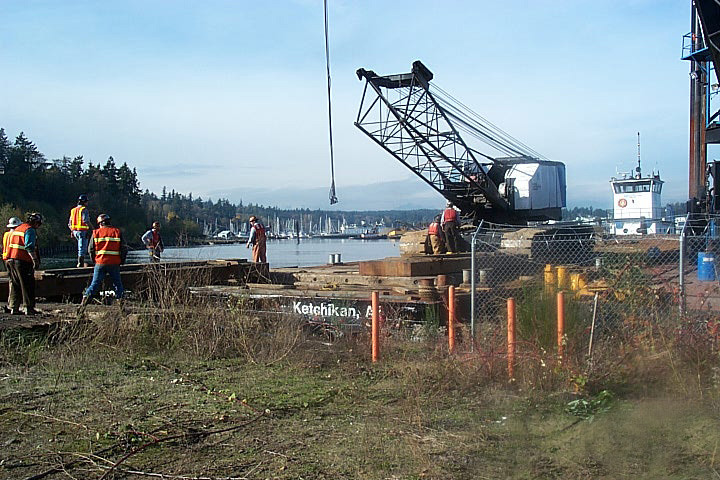 Installation of 183,000+ sf feet of water-tight sheet pile, and 9,000 LF of angled sheet pile. Excavation of over 25,000 tons of soil.